The User Documentation Department would like to know your opinion of this manual. Your feedback helps us optimize our documentation to suit your individual needs. Contact information is included in the back of the manual. with the requirements of the standard DIN EN ISO 9001:2000. Copyright © 2006 Fujitsu Siemens Computers GmbH. Delivery subject to availability; right of technical modifications reserved. remote servers as if you were physically present. access point or over your IP network. your BX600 Digital KVM Switch system easy. prohibited until you enter the appropriate password to reactivate your system. displaying them one at a time, for the amount of time you specify. Through OSCAR, you can easily assign names to server modules for your convenience. This indicates emphasis in the text. This indicates keys or key combinations in continuous text. This indicates additional information and tips. health, the functioning of your system or the security of your data. This indicates a step that you have to perform. These characters symbolize itemized lists. This indicates user inputs in examples. other industry products that support the OSCAR interface. Connect the keyboard, monitor, and mouse to the local KVM cable. Press Print Screen to launch OSCAR, the BX600 Digital KVM Switch interface. Click Setup and then click Menu. The Menu dialog box appears. Select Slot to display servers by slot number. Type a screen delay time of 1 second. You can set up your BX600 Digital KVM Switch in tiers from our KVM appliances. Place the BX600 blade chassis and the KVM appliance in the desired location. Connect the keyboard, video, and mouse cable to the KVM appliance. Connect the other end of this cable to the Local KVM cable. to the appropriate socket on the back of the appliance. displaying in the KVM appliance interface instead of 10.
your KVM appliance documentation for additional information. is set to 1 or more seconds. See “Analog Operation” on page 11. for more information. to soft switch to a server without launching OSCAR. and you press the key sequences before that time has elapsed, OSCAR will not display, allowing you more agility. Press Print Screen to open the OSCAR Main dialog box. Click Setup then click Devices and then click Device Modify. Select the 10-port option to match the number of slots in the BX600 blade chassis. If the 10-port option is not available, select the 16-port option. Click OK to exit OSCAR. now be displayed as 01-01 to 01-10. Figure 6: Main Dialog Box. Connect the other end of the CAT5 cable to a KVM Intelligent Adaptor (KVM-IA). Switch and then to the KVM-IA. chassis server blades. 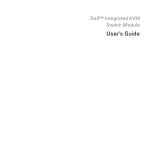 See your s3-1621 Console Switch documentation. the KVMs3-1621 to the BX600 server blades. allow you to select server modules and configure your system. by default, you will see a Name list when you first launch OSCAR. Press Print Screen to launch OSCAR. The Main dialog box appears. in any place you see Print Screen throughout this User's Guide. the Main dialog box. Table 1 describes the status symbols. keyboard and mouse to the proper settings for that Server Module. Double-click the Server Module name or slot number. slot number and press Enter. between the previous and current connections. Module selected. The status flag on your desktop, if active, displays Free. sequences before that time has elapsed, OSCAR will not display. Select Name or Slot for the Display/Sort Key. For Delay Time, type the number of seconds of delay desired before the Main dialog box is displayed after Print Screen is pressed. Module to establish it as unique and press Enter. To switch back to the previous Server Module, press Print Screen then Backspace. Table 2 describes how to use the keyboard and mouse to navigate OSCAR. OSCAR on the currently selected device. Opens the Help screen for the current dialog box. returns to the previous one. Closes current dialog box and returns to the previous one. Clicks OK, then returns to the previous dialog box. again to quit the edit mode. to that particular console, if it is password protected. Moves the cursor from line to line in lists. Moves the cursor to the top or bottom of a list. Erases characters in a text box. Deletes characters in a text box. Type from the keyboard or keypad. Disabled. Use the Shift key to change case. You can configure your BX600 Digital KVM Switch from the Setup menu within OSCAR. tasks for your server modules from the OSCAR menu. Click Setup. The Setup dialog box appears. number. The Names list is always sorted by slot order. Press Print Screen. The Main dialog box will appear. Click Setup and then click Names. The Names dialog box appears. or chassis, the name will not move with it, so the module must be reassigned a name in the new location. click Modify. The Name Modify dialog box appears. characters long. Allowable characters include: A-Z, a-z, Ø-9, space and hyphen. saved until you click OK in the Names dialog box. Repeat steps 1-3 for each Server Module in the system. Click OK in the Names dialog box to save your changes. -orClick X or press Escape to exit the dialog box without saving changes. screen delay time for OSCAR. Select Name to display server modules alphabetically by name. -orSelect Slot to display server modules numerically by slot number. press Print Screen. Entering Ø will instantly launch OSCAR with no delay. OSCAR displaying. To perform a soft switch, see “Soft Switching” on page 12. Click Setup and then click Flag. The Flag dialog box appears. display the flag for only five seconds after switching. NOTE: If only Timed is selected the flag will not be displayed at all. 2, red, Flag 3, blue; and 4, purple. the desktop through the flag. a. Click Set Position to gain access to the Position Flag screen. b. Left-click on the title bar and drag to the desired location. c. Right-click to return to the Flag dialog box. NOTE: Changes made to the flag position are not saved until you click OK in the Flag dialog box. -orClick X to exit without saving changes. any key or move the mouse. You will then need to type in your password to continue. change your password, and enable the screen saver. Click Setup and then click Security. The Security dialog box appears. Single-click and press Enter or double-click in the New text box. are also case sensitive. Legal characters are: A-Z, a-z, and 0-9. In the Repeat box, type the password again and press Enter. Click OK if you only want to change your password, and then close the dialog box. Set your password as described in the previous procedure. password protection and the screen saver feature. returns you to the Security dialog box. Press Print Screen to launch OSCAR. The Password dialog box appears. The Main dialog box appears if the password was entered properly. protection, the Password dialog box appears. Type your password, and then click OK. The Security dialog box appears. Server Module before it automatically disengages you. field. Leave the box blank. Press Enter. Click OK if you only want to eliminate your password. box, continue to the next step. Type the number of minutes for delay time (from 1 to 99) that you want to delay activation of the screen saver. selected. The status flag displays Free. Press any key or move your mouse. The Main dialog box appears. In the Security dialog box, clear Enable Screen Saver. Press Print Screen, then press Pause. NOTE: Enable Screen Saver must be selected in the Security dialog box. see “OSCAR Refresh Rates” on page 40. Click X or press Escape to close the Version dialog box. If OSCAR is not open, press Print Screen. The Main dialog box will appear. Click Setup and then click Scan. The Scan dialog box appears. The dialog box contains a listing of all the server modules attached to your unit. Click to enable the check box next to the server modules you wish to scan. -orDouble-click on a Server Module's name or slot. before the scan moves to the next Server Module in the sequence. Click Commands. The Command dialog box appears. 3 Select Scan Enable in the Command dialog box. Select a Server Module if OSCAR is open. will stop at the currently selected Server Module. -orPress Print Screen. The Main dialog box will appear. you go through the Fujitsu Siemens Management Blade (MMB). viewer or manipulate virtual media (See Appendix B). Switch. You may then access the video viewer and manipulate virtual media. From your browser, type in the correct URL to bring up the MMB interface. On the left side, select Console Redirection. On the right side, select the Server Blade from the drop-down list. would like to interact with. Click the Servers button in the list of servers. Click the Select Server button. The Launch Application button will become active. Click the Launch Application button. The server’s desktop will appear. the remote system without affecting your local workstation. Click Calibrate on the viewer toolbar. Dialog Box Options” on page 29. Click Refresh on the viewer toolbar. Click Create Snapshot on the viewer toolbar. Click Help on the viewer toolbar. Click Close on the viewer toolbar. expand your Viewer to fit the entire screen or refresh the view at any time. typed using your local keyboard without affecting your local system. From the Keystroke Macros list, select the macro you want to send. Click Send. The keystroke macro is sent to the remote system. The Mouse Acceleration list allows you to select the operating system you want to view. Linux for the Linux operating system. the Automatic Video Adjustment will optimize the video for the best possible view. NOTE: Only 7-bit color is supported. In the Viewer, click Calibrate. The Auto Video Adjust dialog box appears. Click the Manual Video Adjust button. Click the icon for the feature you wish to adjust. When finished, click Close to exit the Manual Video Adjust dialog box. small number of pixels on the screen will be discolored or white. Adjust the contrast and brightness until the image quality improves. performance, while still being able to recover pixel colors over which the mouse cursor travels. the ends of the slider bar for fine-tuning. for optimal display quality and performance. noise threshold to just above zero. performance, while still being able to recover pixel colors that the mouse cursor travels over. Plus (+) and Minus (-) buttons at either end of the slider bar for small, incremental adjustments. want to deactivate the mouse acceleration in the operating system of the target server. Select Start then select Settings and then select Control Panel. Click on the Motion tab. Adjust mouse speed to the exact midpoint of the slider bar. In the Acceleration setting, select the Off radio button. Cycle through the tabs until the pointer speed slider is displayed. Adjust the mouse speed to the exact midpoint of the slider bar. Click the Acceleration check box to turn off acceleration. Select the Mouse settings from the Desktop Controls. Apply the changes and click Mouse Synchronize/Screen Refresh in Video Session Viewer to resynchronize the mouse. Open a Console window in the Desktop. NOTE: On some Linux distributions, this procedure needs to be performed each time you log onto the Desktop. (or floppy image) and a single CD/DVD device (or CD/DVD image) to a target server. Click the Select Device drop-down list in the list of servers. Click the Launch button. The Virtual Media dialog box will appear. It will be associated with the server you chose from the drop-down list. selected generic mass storage device is not mapped until you click Apply. select the No CD/DVD option. mass storage device is not mapped until you click Apply. target drive is mapped and the number of bytes read (for that device) are displayed. Click Details to display or hide this panel. BX600 Blade Server using a Graphical User Interface (GUI). KVM switch that is installed in the BX600 blade server. Select Blade Info from inside the DKVM Blade folder in the left column. valid IP address to it. the first three steps of the following task. Select Network Configuration from inside the DKVM Blade folder in the left column. Enter the network mask by filling in the boxes in the Network Mask field. cases, you can leave this setting at the default value. may leave this setting at the default value. leave this setting at the default value. A typical network configuration page is shown in the following illustration. Select Console Redirection from inside the DKVM Blade folder in the left column. Select a blade server from the drop-down list in the screen that appears. The Console Redirection page is shown in the following illustration. For details on using the Video Viewer, see “Using the Video Viewer” on page 26.
were installed on the remote blade server. This feature is known as virtual media. Select Virtual Media from inside the DKVM Blade folder in the left column. For details on using Virtual Media, see “Virtual Media” on page 31. You can update the firmware on the BX600 Digital KVM switch from the MMB. Select Firmware Update from inside the DKVM Blade folder in the left column. boxes in the TFTP Server IP field. inoperable, and it will be necessary to return it to Fujitsu Siemens for a firmware reinstallation. The Firmware Update page is shown in the following illustration. this manual to see if the issue can be resolved by following the procedures outlined. phone numbers in your area. Check all cables to make sure that they are connected. diagnostic tools that come with your system. software problem, see the documentation for the operating system or program.